Ok, without using Google (or any other seach engine other than your grey matter), how many of you can remember who won the very first Big Brother South Africa show? Not having ever watched any of the shows, I felt I was allowed to look it up. Apparently it was Ferdi. Ah yes, I remember now, I hear you say. Now, can you remember who did the theme music? I can give you a clue, it was the track that is this week’s entry on the 1,001 SA Songs List. Yes, it was Semisane’s ‘Life’ that had the honour of entertaining you as you sat down to your daily dose of voyeurism back in 2001. From my understanding of what went on in the BB house, I do find the first line of the theme tune rather odd – ‘Everybody’s looking for some tenderness’. I would hardly think that the BB house would be the place to find that. In fact the whole song initially, to me, seemed a little at odds with the whole concept of ‘Big Brother’. It is quite a relaxed tune but with Tikara’s somewhat girlie vocals sidling up to a somewhat haunting tune, there is something uncomfortable about this and I can’t quite put my finger on why this is. Perhaps that’s why the song was right for the show as it got under the skin in a weird sort of way. ‘Life’ spent 3 weeks at the top of the SA Rock Digest charts and was rated the 8th best song of the year by that esteemed publication. Semisane’s debut album, ‘A Life Less Strange’ starts off with a quiet, almost unassuming intro, almost as though it is tip-toeing into our lives. The start of ‘Trying To Believe’, the opening track, is understated, yet beautiful. Even when Tikara’s vocals arrive, it is still a softly softly approach with a sweet sound. The only time the song gets a little bit louder is when the chorus arrives, and this does so in a controlled yet somehow soaring kind of way. There is a lot of emotion and feeling in this track. It has a feel of one of those song in a film soundtrack where it’s the morning after the characters, who have gone through a rough patch and have made up (usually in bed), have woken up wondering if they have done the right thing and do not know what will happen next. There is an aching in the song like people who really want to be in love but just don’t know how to make it work. 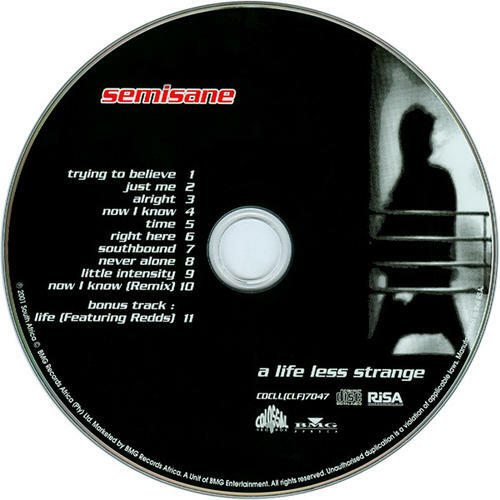 ‘Trying To Believe’ was Semisane’s first hit to make the SA Rockdigest Charts in 2000 where it went to number 7, enjoying a run of 8 weeks on the charts. Yes, they would go on to have bigger hits (including 3 SA Rockdigest number 1’s), but this subtle, yet beautiful, piece should not get left in the shadow of their other hits. 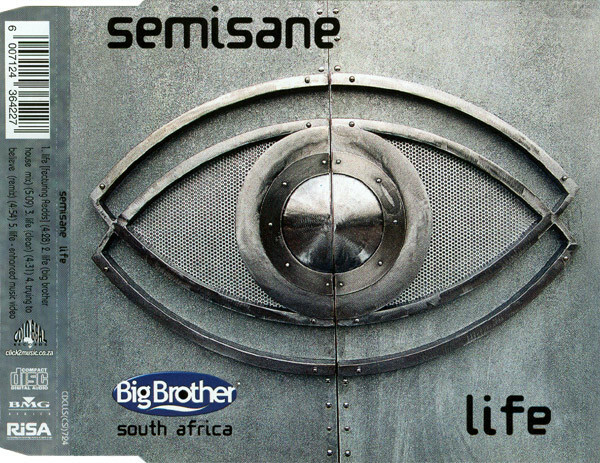 Semisane came together in 2000 and quickly garnered a fan base which threw them into the musical limelight in South Africa and ultimately led to them writing the theme tune to the Big Brother TV series there. But that is getting ahead of ourselves. One of the steps on the ladder to scale those dizzy heights was to put together an album which they did – ‘A Life Less Ordinary’ – and then to choose a single to get airplay. That first single was ‘Right Here’. A chilled out affair, ‘Righ Here’ sounds a bit like Alanis Morrissette on valium. There isn’t the angst and anger that Morrissette had, but there is the catchy tune with a stong female vocal (courtesy of Tikara) underpinned by jangling guitars. It seemed the perfect single to ease you into the not quite mad world of Semisane. The song topped the SA Rockdigest Charts and went on to be voted the 7th best song of the year by that publication. Two more of their songs (‘Trying To Believe’ and ‘Alright’) also made the top 50 songs of the year list and the album ‘A Life less Strange’ made 4th on the album list. Not bad for their first year’s work.